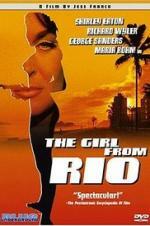 Buy or Rent The Girl from Rio (1969) Movie DVD & BluRay Online! Movie Plot: Jeff Sutton arrives in Rio de Janeiro with a suitcase with 10 million dollars, and the powerful mobster Sir Masius sends his henchman Carl with his gangsters to follow Jeff and get the money. Jeff has one affair with the manicure Leslye and succeeds to escape from Sir Masius’ mobsters. Meanwhile, Sumuru, the leader of the women of the City of Femina that wants to defeat the men and take over the world, captures Jeff and brings him to Femina expecting to get the money. Sumuru has several prisoners locked in glass cages, including Ulla Rossini, who knows Jeff Sutton. Jeff discloses to Ulla that his arrival is part of a plan to save her from Sumuru. Jeff Sutton becomes a pawn in the middle of the war between Masius and Sumuru.